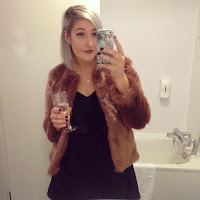 Hey lovelies :) sorry I haven't blogged in a while, I've literally had so much uni work, plus I've been celebrating (and feeling slightly depressed) about my 22nd birthday, which was Monday! :) A couple of my best friends came up for the weekend, and I managed to juggle having some fun nights out, some nice meals with some of my boring uni work too! Well I couldn't say no to a Katsu Curry from Wagamamas could I!? Drunk selfie in the club, but thanks to my bestie for doing my make up! Hope you've all been having lots of fun in the sun! Hope you had a good birthday! so fuuun. i wanna come hang out! It was very yummy and I love the cat watch! Mmm me too now, I love Wagas! Haha yes uni is fun sometimes but hard work lots too! Happy belated birthday! Looks like you had a blast! Happy birthday. I've just discovered your blog. Do it yourself: Rose floral headcrown!